The holidays can be the most stressful and overwhelming times of the year. 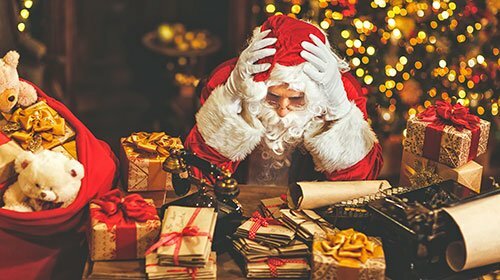 This is due to a number of reasons, but the most common tend to deal with the holiday stress of finances, traveling, and entertaining. Many times this can lead to holiday depression and health risks. This stress and anxiety combined with an excess amount of food and holiday weight gain can put strain on an already unstable heart. In fact, many hospitals see an increase in cardiac related problems during the holiday season. A study performed by researchers at the University of California and Tufts University School of Medicine examined 53 million U.S. death certificates from 1973 to 2001 and discovered an overall increase of 5% in heart related deaths during the holiday season. They also discovered that the highest amount of cardiac related deaths occurred on December 25, followed by December 26, and then by January 1. Signs of heart disease can be very subtle during any time of the year, but even more so when you are busy. A shortness of breath could be attributed to hustling about purchasing gifts. Fatigue could be from late night holiday parties. Nausea and indigestion could be from a new dish. Then, there is the fact that this is one of the busiest times of the year and most people do not have the time to stop and think, is this just indigestion or could it be something more? Watch what you eat and drink. While it is perfectly acceptable to enjoy the Christmas ham and cookies, try not to overindulge yourself. Also, balance your plate with a few greens. It is important to monitor your holiday weight gain. Continue a healthy exercise routine. During this time of the year, many people ditch their exercise with the thought to pick it up again after the new year. Even a simple walk around the block can help with a healthy blood flow. If you have a mostly sedentary lifestyle, be sure to check with your doctor to see what exercises are right for you. Bundle up. Cold weather can be hard on the heart. It can constrict blood vessels, which, in turn, raises blood pressure. This can be seen especially during physical activities such as shoveling snow. Take a moment to breathe. If you feel yourself getting overwhelmed or anxious, take a few moments to yourself and take a few deep breaths. This can help lower blood pressure and help relax yourself during stressful situations. Take your prescribed medication. If you are on prescribed medication make sure you are taking it at the times directed. Set an alarm on your phone to remind you to take them even in the rush of the season. Pay attention to your body. Know the signs of a heart attack. Even if you think it could just be indigestion or heartburn, check with a physician. People who have had a heart attack are at increased risk of another. Know your risk. It is always good to know your risk for a coronary event. A scan at Advanced Body Scan can give you invaluable information about your calcium score and your risk for a cardiac event with a Heart & Lung Scan. For more information about avoiding a deadly holiday heart attack visit the American Heart Association. Don’t let the hustle and bustle of the holidays be the reason you neglect signs that could save your life. If you think you may be experiencing any signs of a cardiac event, don’t wait until after the holidays and visit your nearest hospital. However, the best prevention is to know your risk before sign or symptoms occur and receive your scan with Advanced Body Scan.